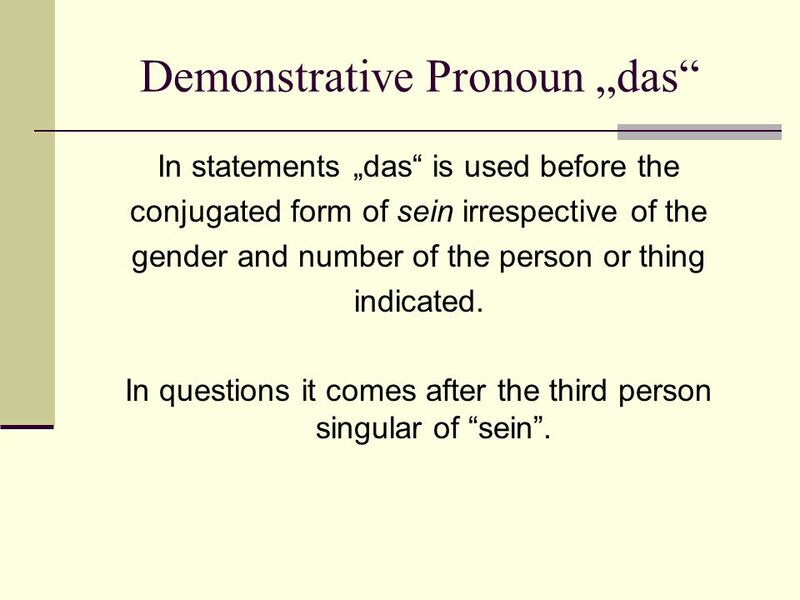 Demonstrative Pronoun das In statements das is used before the conjugated form of sein irrespective of the gender and number of the person or thing indicated. 1 Demonstrative Pronoun das In statements das is used before the conjugated form of sein irrespective of the gender and number of the person or thing indicated. In questions it comes after the third person singular of sein. 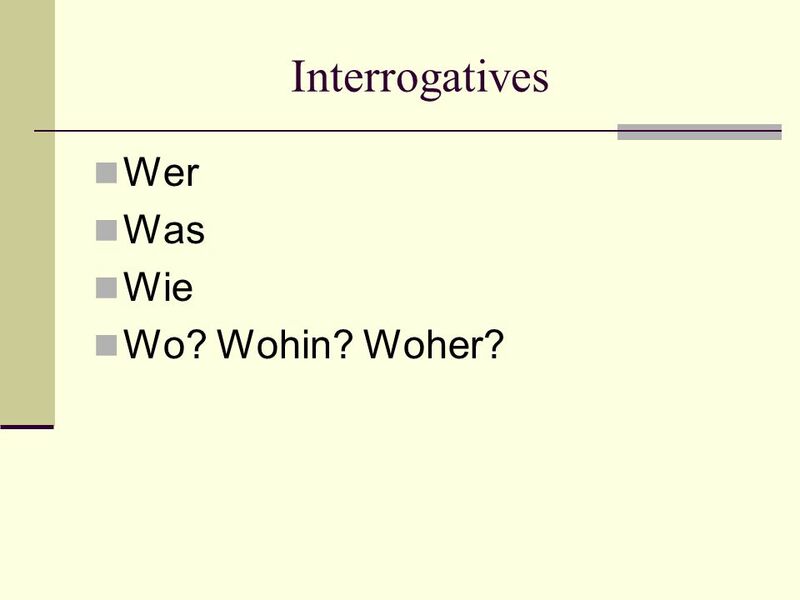 2 Interrogatives Wer Was Wie Wo? Wohin? Woher? Download ppt "Demonstrative Pronoun das In statements das is used before the conjugated form of sein irrespective of the gender and number of the person or thing indicated." Wie heißt du? Einführung. | 2 Copyright © Cengage Learning. All rights reserved. Das Alphabet. Deutsch 1 A1 Einheit 5. Nouns as Subjects S Verb D.O.. The Past Tense Part Three!. The past Tense with Sein As with haben the past participle (ge word) goes to the end of the sentence. You also need a bit. Jeopardy Numbers Classroom Objects Phrases Present Tense Math Problems Q $100 Q $200 Q $300 Q $400 Q $500 Q $100 Q $200 Q $300 Q $400 Q $500 Final Jeopardy. Die Hausaufgaben: Im Buch Ü. 1 u. 2 auf S. 36 -Quiz on Thursday (be sure to know how to spell) -numbers (0-20) -greetings/goodbyes -how to ask for someones. By Mason Sisson. 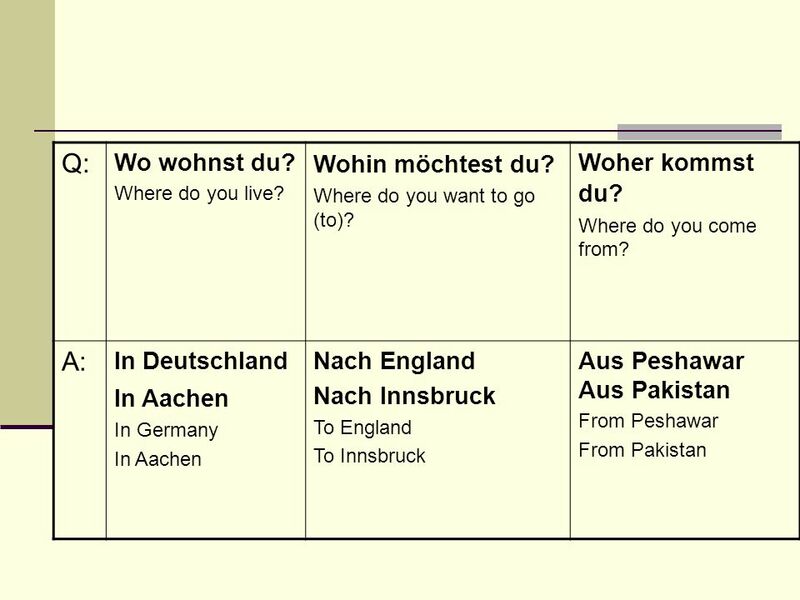 Zu Hause means at home (location) Nach Hause implies going home (motion) The verb indicates motion nach Hause is used. The verb does. Verb Practice German 1. The boy knows Mrs. Spatz Der Junge kennt Frau Spatz. Agenda & Notes 9/30-10/4. Glöckner I come by bus. He comes by subway. She comes by foot. We come by car. Hausaufgaben Where do you come from? I come from. 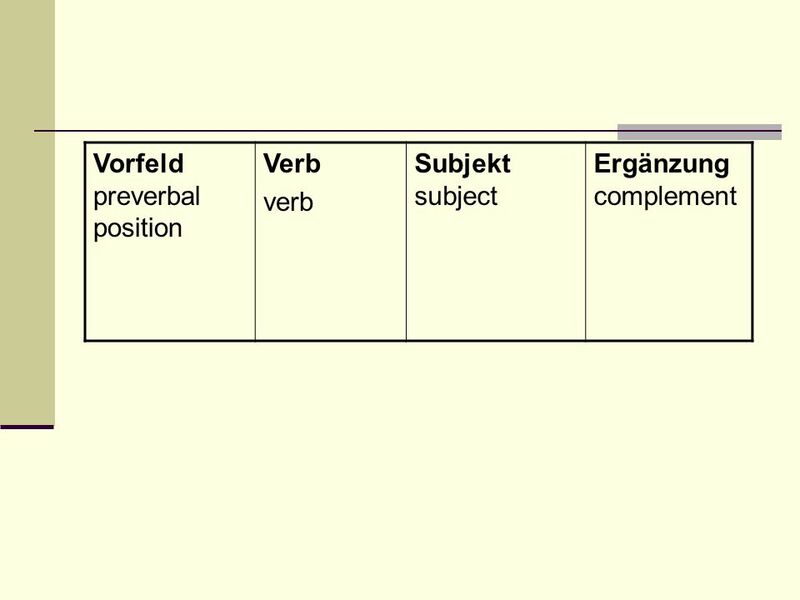 1.1 Lektion 1 F ühlen und erleben STRUKTUREN © and ® 2012 Vista Higher Learning, Inc Word order: statements and questions Wir haben folgendes Angebot. (or how to change verb forms to match each subject correctly! Wo wohnst du? er? Woher kommst du? sie?. Hast du gewusst? All verbs end in en when you look them up in the dictionary, but sometime verbs like to dress. The formal of du, ihr, and Sie By: Anibal Palacios. German for Beginners Deutsch für Anfänger FSLT13 Microteaching. WAS LERNEN WIR UND WARUM? What are we learning and why? Deutsch Jeopardy!. Describing People OccupationsTalking About Your Family VerbsConjugating 100 200 300 400 500 Choose A Score To Start The Game CLICK.